If the remaining eleven months of the year go by as quickly as January, I might as well go ahead and say Happy New Year again and ring in 2017! The past 31 days have flown by and I feel like I may have even missed half of the month! I’m confident in saying ‘glad I’m not the only one’ as I suspect some of you are in the same boat! Now that it’s January 31st and we’ve had a brief break from the holidays, it’s time to get ready for Valentine’s Day! I love Valentine’s Day for two main reasons, my husband who never fails to make me feel extra special and my stepdaughter who adores the creative heart accents and surprises found throughout the day. Last year was perfect from a themed date night at home with my husband to a holiday filled with heart shaped food and family time with my stepdaughter. Interested in the details? Check out last year’s post: https://ourfrontdoorlookingin.com/2015/02/15/valentines-day-2015/! 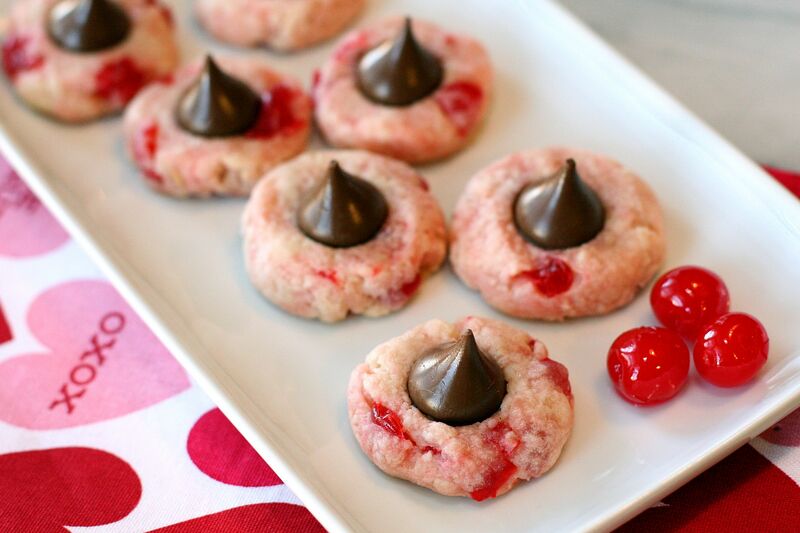 With exactly two weeks to go until Valentine’s Day we started to celebrate this weekend by baking a tasty treat made with one of Hailey’s absolute favorite ‘foods’, maraschino cherries. 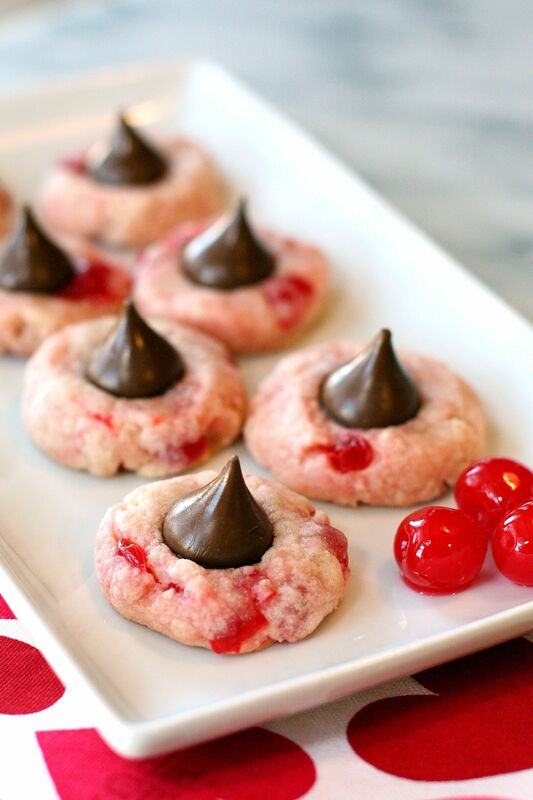 I figured this would be the perfect cookie to bake, because I’m actually not a big fan of maraschino cherries and therefore wouldn’t eat them…except I’ve already had two. Oops. So if I liked them, you know the true maraschino cherry lover in the family would thoroughly enjoy them! And she did…Hailey said they were “realllllly good” as she proceeded to eat three cookies that afternoon 🙂 If you want to make the dough a deeper red, you can add red food coloring to the recipe. I chose not to so the color comes just from the juice in the jar of cherries. I think they turned out perfectly for Valentine’s Day with a nice blush/pink color that pairs well with the red cherries. I will tell you the original recipe I followed felt like it had too much flour and not enough juice to the point that I added a tiny bit of water to keep the dough moist. I’ll do my best to modify the recipe below and keep you from having to do the same, but please keep that in mind and adjust as needed while baking! In a large mixing bowl, beat butter on med-high speed for 30 seconds. Add powdered sugar and salt and beat until well combined scraping down sides of bowl as needed. Beat in the cherry liquid and almond extract. Gradually add flour while mixing. (You may not need the full two cups so judge this as you go) Once the dough is well mixed, remove bowl from stand and fold in chopped cherries. Roll dough into 1 inch balls and lightly coat with sugar by dropping or rolling them in a small bowl of sugar. Place on cookie sheet and flatten to about 1/2 inch thickness using your hand or the bottom of a drinking glass. Bake 14 minutes or until the bottom of the cookies are lightly browned. Immediately place the chocolate kiss in the center of each cookie and transfer to a wire rack to cool.